Wakefield Trinity Wildcats moved up to sixth spot in Super League with a gutsy 30-28 victory at Catalans Dragons. 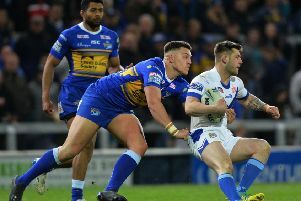 Trinity, whose place in the Super 8s was assured by Hull KR’s 36-12 defeat at Hull FC on Thursday evening, lost Mickael Simon to injury early on in Perpignan but showed their fighting spirit to claim the two points. Max Jowitt crossed and Liam Finn converted to put the visitors ahead on eight minutes but Dragons stormed back with touchdowns from Tony Gigot, Dave Taylor and Justin Horo, all improved by Richards, to put the hosts 12 points ahead with half-an-hour played. Gutsy Wakefield levelled matters with Finn-converted tries from Jon Molloy and Craig Hall that restored parity going into the break. Bill Tupou’s superb try gave Trinity a great start to the second half, Finn again adding the conversion, only for Morgan Escare to reply on the hour. Richards’ goal levelled the game once again. Michael Sio barged over, Finn converting, and Fouad Yaha crossed for Dragons, but Richards missed the conversion to leave Catalans trailing by two with nine minutes left. Wakefield held firm in the closing stages to protect their lead and claim an excellent win.